Living/Kitchen, 1 Bedroom, 1 Studio, 1 Bathroom, Patio For 'Al Fresco' Dinner. 'Casa de las Cruces' is a brand new remodeled and decorated mexican style house. Located in downtown La Paz, 5 minutes walking to the boardwalk and the best restaurants, shops, markets and nightlife in town. A living room with fully equipped kitchen, a master bedroom with king size bed, a studio with a queen size sofa/couch, a bathroom, a lovely furnished patio with barbecue, table and chairs for 'al fresco' dinner. The house has air conditioners in the living room, in the bedroom and in the studio. Ceiling fans everywhere. Is fully furnished, super quality linens and towels, super quality matress. The kitchen is fully equipped and everything is brand new. WIFI internet, cable TV with DVD player, a local cel phone upon request. Quiet and safe and private. I am the owner of a B&B in La Paz 'Casa Verde Inn' and of another property listed on VRBO. Your comfort and your pleasent stay is my pleasure and my business. I spent ten years in La Paz. I'm italian but I was born in Africa. I have a small B&B in La Paz 'Casa Verde Inn' and a couple of properties for rent. Is very central, close to the beach in a safe area. Is a small, charming, old Mexican house. All the details inside and outside the house are from my experiences travelling in Mexico. Perfect house for a couple, with a guest maybe. Or good for 4 people. You don't need to rent a car because Casa de las Crucitas is close to everything in La Paz. Quiet and private, has everything you need to start enjoy your vacations....with style! Just in the hearth of La Paz, 5 minutes walking to the boardwalk (Malecon Costero) and to the best restaurants and shops in town. 5 minutes walking to the famous grocery market 'Mercado Madero'. Fully equipped, stove, refrigerator, freezer, blender, toaster, coffee machine, water heather, pots and pans, dishes, glasses, etc. Casa de las Cruces is a special Mexican house. Cozy, private, quiet and unique. Good details, good quality linens and towels all for your pleasant stay. We loved stating at Casa de las cruces! Everthig was great except the shower head, water comes out very little and needs a shower curtain! When we showered up the floor was wet, the water was everywhere! Other than that 👍🏼👍🏼! Very quiet, very clean. Great location. 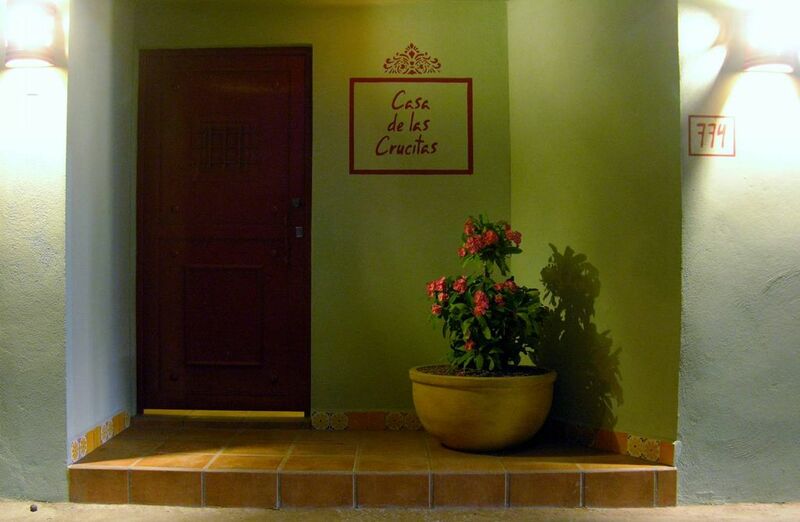 We loved our stay at Casa de la Crucitas. The location was good for access to the boardwalk. The unit was very nicely appointed, clean, and very quiet despite being close to the street. The air conditioning in each room was a real bonus as the temperatures outside were in the 30C range every day. We self catered most of the time and the nice kitchen made it easy. I would highly recommend this unit. Very nice property on the inside. Area not so great. Very nice place to stay. Shower and water pressure was a little low, but otherwise a clean and neat casita. Could have stayed a lot longer! My partner and I were here for only two days but it was perfect. Very clean, attractively furnished and decorated, private. Walking distance to everything. Highly recommended! La Paz, a beautiful quiet and safe place to start your adventure in Baja California Sur. Whale and shark whale's watching, tour to Espiritu Santo island, fishing, kayaking, hiking to Sierra de la Laguna, windsurfing and kitesurfing at La Ventana Bay. Beautiful beaches as Balandra Bay, Tecolote, La Sorpresa, Los Muertitos, Ventana Bay, El Pulgero. Good mexican and international restaurants on the boardwalk, nightlife in the local bars and clubs with live music and attractions. Rates are subject to change until reservation is confirmed. Refund and cancellation: 50% within 30 days or more notice of cancellation No refund in high season (August and December) No refund with less than 30 days notice. Apply PayPal fees. Taxes included.